The playgym is by far the best playgym I have ever purchased. It is nice to look at, easy to put together (the directions were great! 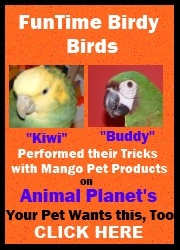 ), "user" friendly for the birds, great price for the quality and the customer service was above and beyond GREAT! So you have another happy customer! I did take some pictures and would love to have you put them on your site. Thanks again for your great product and customer service. All three birds have been on the gym already. I know I will be back for more toys!